We’re winding down our #diGSummer July special, but we wanted to make one last splash before we go. We’ve already hit up the rivers and falls across the island, as well as our country’s incredible beaches. Today, we invite you to dive into the adventure of our waterparks. Enjoy! Wata Land is located in Industry, St Mary – about 15 minutes from Ocho Rios. Visitors have access to an impressive aqua park, water slides, and a three-acre pool-lake, the largest in the Caribbean. Kool Runnings Adventure Park in Negril, Westmoreland, offers seven water slides – Jamaica Bobsled Ride, Kick Puppalick, Lightning Bolt, Sly Mongoose, Green Grotto, Duppy Conquer and Red Snapper, along with the Rio Bueno Leisure River and Captain Mikie’s Coconut Island for the non-thrill seekers. 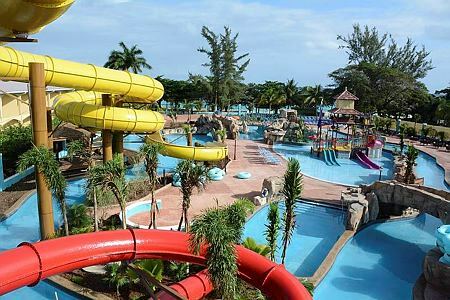 The Jewel Lagoon Water Park, located on the property of the Jewel Runaway Bay Resort in St Ann, offers a variety of attractions for the whole family, including small children. These include two splash-down pools, kids gang slide, lazy river with rock grottos and waterfalls, speed slide and family raft ride. Billed as the “most thrilling water park in the Caribbean,” the 18,000 square foot Pirate Island, located on the properties of Beaches Ocho Rios in St Ann and Beaches Negril in Westmoreland, features water cannons; kiddie pools; tube, body and speed slides; lazy rivers; supervised camps for kids of all ages and more. The Sugar Mill Falls Water Park at the Hilton Rose Hall in Montego Bay, St James, is the second largest such facility in the Caribbean. It offers a 280-foot water slide; three terraced pools, lagoons, and waterfalls; a lazy river; a 36.5-meter free-form pool and a jungle garden – complete with a rope-and-wood suspension bridge, faux rock formations and replicas of the aqueducts of the former Rose Hall Plantation. The Pirate’s Paradise Waterpark is a feature at the Sunset Beach and The Oasis at Sunset in Montego Bay. The waterparks feature Fort Henry and Port Royal Two waterslides – a whopping 240 feet in length and 40 feet high; Black Pearl Sunken Pirate Ship; two Jacuzzis; Blackbeard’s Lazy River’ waterfalls, splashes and squirts and more. Located on the Walter Fletcher Beach Complex, Aquasol Beach Park offers activities for the whole family, including water sports, tennis, kid’s games, table tennis and the MoBay 500 go-cart racing course.